The Daniel Group will move to our new office, 5424 Katy Freeway in November 2018. The Daniel Group held an official groundbreaking ceremony at the site for The Daniel Group new office building in mid-January 2018. 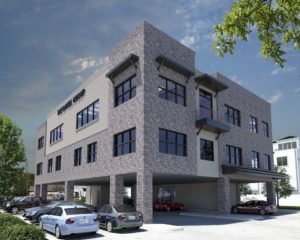 The new building will be located at 5424 Katy Freeway between TC Jester and Radcliffe in Houston, TX. The site was chosen on Katy Freeway due to the central location, direct access to major thoroughfares and visibility. Building access is available from the feeder road of the Katy Freeway, with two additional entrances off Cornish. The three-story building will be constructed on one-half acre and will include 17,664 SF. The bottom floor will include covered parking. The Daniel Group will occupy the entire 3rd floor while the 2nd floor will be sublet to another tenant. 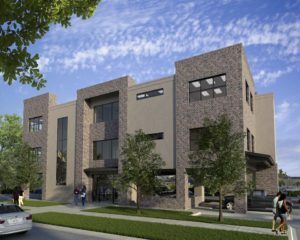 The new building will consist of an open floor plan with a ‘heights warehouse’ design including exposed brick, open ceilings, and wood floors. The exterior of the building will be brick and stucco. Joining Jarrod Daniel and his wife, Denise, at the groundbreaking, were Anthony Arriaga, President, Arriaga Companies; Darrin Harvey, Richard Grothues Designs, Inc.; Bobbie Bozarth, Senior Vice President, Transwestern; Lance Ramesh, Commercial Banking Officer of Allegiance Bank; and M. Dale McGill, Vice Chairman and Executive Bank Office President, Allegiance Bank. The completion date for the project is scheduled for November 2018.